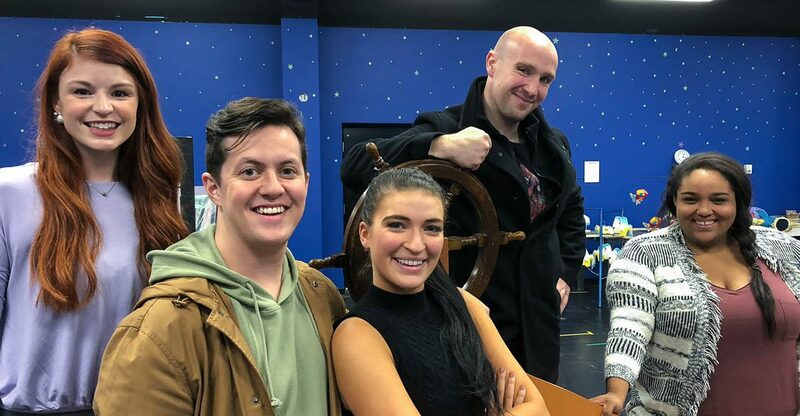 Belmont alumni Catherine Birdsong (“Ariel”), Piper Jones (“Ursula”) and Isaac Brotzman (“Scuttle”), along with current students Lexie McEntire and Jack Tanzi, are appearing in the upcoming run of “Disney’s The Little Mermaid” production at Nashville Children’s Theatre. Nashville Children’s Theatre (NCT) is the nation’s oldest professional theatre for young audiences and the largest theatre in Middle Tennessee. Pictured above are the Belmont actors at a recent rehearsal for the show: (l-r) Birdsong (2010, musical theatre), Tanzi (senior, theatre and education), McEntire (senior, musical theatre), Brotzman (2016, musical theatre) and Jones (2012, commercial music). “Disney’s The Little Mermaid” has music by Alan Menken, lyrics by Howard Ashman and Glenn Slater, and book by Doug Wright. The musical runs at NCT from November 8 – December 23, 2018. Single tickets are on sale now and available by calling NCT’s box office at 615-252-4675 or visiting NashvilleCT.org. All performances take place at The Martin Center for Nashville Children’s Theatre, 25 Middleton Street, Nashville. Free parking is available on site.